Hunched over sewing machines and stitching tables, the last of Lynn’s leather craftsmen — and one woman — carry on a trade with ties to the city’s golden age of leather manufacturing. In its heyday, more than 60 years ago, F&J Leather Inc. kept 50 stitchers, cutters and other leather trade specialists employed. Seven years ago, 13 people worked for owner Frank O’Donnell, but now it’s only O’Donnell, 80, and longtime employee Freddy Escobar. “He’s my key man,” O’Donnell said. Inside O’Donnell’s shop in the J.B. Blood Building’s basement, Escobar and O’Donnell use metal pattern frames to turn dyed leather goat skins and cowhides into pieces that are stitched together for handbags, saddle bags, purses and wallets. 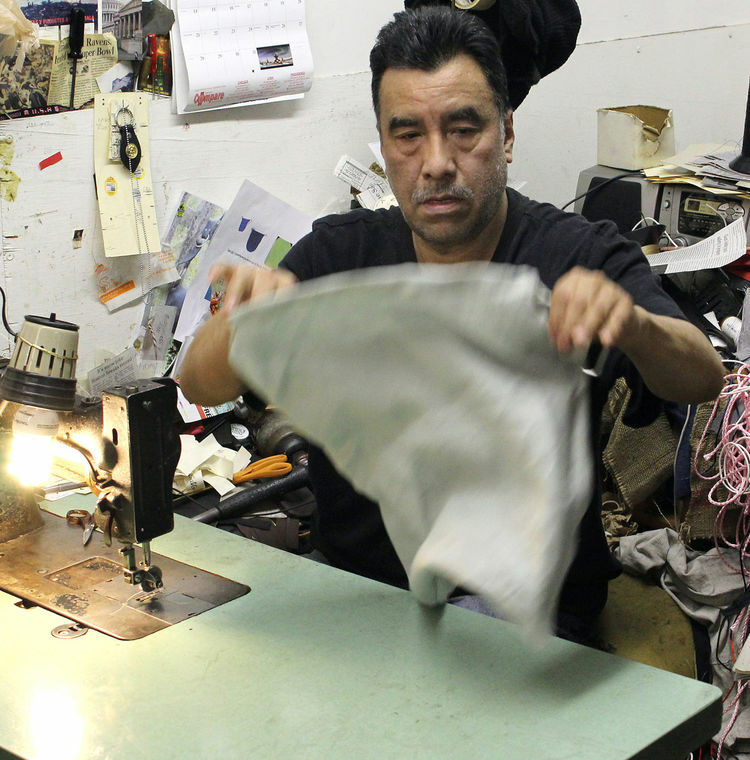 O’Donnell is not the last of Lynn’s leather makers: Others include two shops smaller than his plying their trade in the Lydia Pinkham building where Mecca Leather and Domenico Leather — both two-person operations — turn out goods. Ray Bona operates Mecca with his wife, Maria, who founded the business 30 years ago. Like Domenico, they make leather coats, jackets and other items for Walter Dyer Leather, a former Lynn firm now located in Framingham. “We make all leather goods from scratch,” Bona said. O’Donnell sells some of his products to Midwestern leather outlet stores and some of his goods are sold online or to contractors who order items like the 100-cloth drawstring bags Escobar stitched on Monday. Imports from China, India, Pakistan and Mexico have whittled away over the years at O’Donnell’s customer base and his income. Leather factories were operating in Lynn before America fought its way from colony to country. The shoe industry exploded locally in the 19th century and O’Donnell recalled when Lynn had 5,000 union shoe workers with half of them working in seven of the largest local shops. O’Donnell’s father opened a leather factory in 1946 in Salem and O’Donnell started learning the leather trade at the age of 11. He swept floors and ran cutting machines like the 60-year-old ones still operational in his shop. After he finished a stint in the Navy in 1959, his father handed over the business to him. “He said, ‘Do with it what you want,’” O’Donnell said. F&J O’Donnell’s survived even as the leather industry died out in Lynn. Located in the Vamp building during the 1981 fire, O’Donnell said workers extinguished flames igniting on the shop windows even as manufacturing continued inside the shop. “We made a decent living,” he said. He said he has kept the business open to reciprocate the loyalty 23-year employee Escobar has shown him and with support from Blood building’s owner, the Economic Development and Industrial Corporation. “(Executive director) Jim Cowdell has been very good to me,” he said. O’Donnell is not sure how long F&J Leather will stay in business, but he said coming to work beats the alternative. “Sitting at home watching TV is not for me,” he said.